A Retinal Tear is usually the result of vitreous traction on the retina. This process can be associated with a posterior vitreous detachment (PVD). Some eye conditions, such as high myopia, are associated with areas of the retina which are abnormally thin, predisposing to retinal tears. 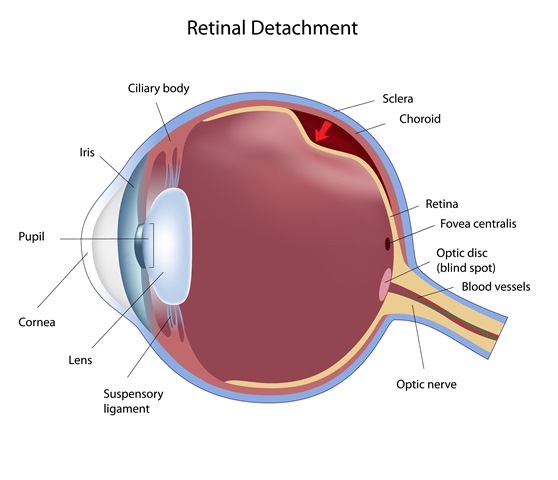 Retinal Detachment occurs when the retina is separated from its underlying layer, or pulled away from its normal position in the back of the eye. Retinal tears can lead to retinal detachment by allowing fluid to pass behind the retina and lifting it off the back of the eye. Warning symptoms of retinal detachment may include (1) flashing lights, (2) new onset of floaters, (3) a shadow or curtain across your field of vision, or (4) partial, or complete, loss of vision. These symptoms require a careful retinal examination. Major risk factors for Retinal Detachment may include (1) High Myopia, or nearsightedness, (2) Previous retinal detachment in the other eye, (3) Family history of retinal detachment, (4) Weak or thin areas in the retina, (5) Severe injury, or (6) Some congenital disorders. Retinal detachment is a serious visual problem that almost always causes blindness if left untreated. Retinal tears: Most retinal tears need to be treated with laser or cryotherapy (freezing treatment), which is applied around the torn area to seal the retina to its proper position in the back of the eye. This is an office procedure. (1)	Pneumatic retinopexy is a procedure where a small gas bubble is placed in the vitreous cavity to support an area of torn and detached retina against the eye wall. Laser (or cryotherapy) is subsequently applied to strengthen the retina’s attachment to the eye wall. This is can be performed in the office. (2)	Vitrectomy is a surgery performed to remove the vitreous gel and fiber/scar tissues which may be pulling on the retina. Air, and then gas, is used to flatten the retina against the eye wall. Laser treatment is also applied to help keep the retina flat against the eye wall. Silicone oil may sometimes be used instead of gas to help keep the retina flat. If gas is used, the gas bubble will naturally be absorbed within 1-2 months. (3)	A Scleral Buckle is a surgery where a flexible silicone band (buckle) is placed around the eye to support the eye wall against the retina. This is usually done in conjunction with laser or cryotherapy. There may be some mild discomfort after retinal surgery. You will receive instructions on how to use your eye drops after surgery. You cannot fly if a gas bubble is placed during surgery. Your surgeon will let you know when the gas bubble is absorbed, after which it will be safe to fly. There is no flight restriction if silicone oil is placed during surgery.